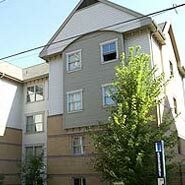 i3 Scholars will be staying in Bouquet Gardens G on the University of Pittsburgh campus. Each air-conditioned unit is furnished and typically includes four single bedrooms. Bouquet Gardens is located a few blocks from the heart of campus. Each air-conditioned unit is furnished and includes four single bedrooms, a kitchen with refrigerator, stove and microwave, a living room and dining area, and two bathrooms. Laundry facilities are located on the second and third floors. Machines are card operated. You may load monies on your building room access card (Panther Utility Card) at Panther Central. Pitt's campus is located in Oakland, one of Pittsburgh's most vibrant urban neighborhoods. Oakland is home to the University of Pittsburgh, Carnegie Mellon University, and the University of Pittsburgh Medical Center (UPMC). i3 Scholars will be able to take advantage of the many restaurants and shops, all within walking distance. i3 Scholars will also be able to move around Pitt's campus and the city using the Port Authority transit (city buses) or the University of Pittsburgh shuttles, all for free! Check in is located at Panther Central, which is staffed seven days a week, 24 hours a day. Panther Central is located in the lobby of the Litchfield Towers at 3990 Fifth Avenue, Pittsburgh PA 15213. i3 Scholars will receive key cards at check in for access to assigned rooms. Please contact Panther Central at (412) 648-1100 for 24-hour service. During the summer months the Campus Shuttle will accept your Panther Utility Card. Please note the shuttle does not operate on the weekend. Summer temperatures in Pittsburgh typically range from 70-85(F) degrees daytime and 55-65(F) degrees in the evening. Brief rain showers are also common in June and July. To ensure you are comfortable throughout your stay on campus, please see the packing list below.